Summary: The Gospel according to Luke presents preachers with challenges. While some passages announce earth-shattering change and societal upheaval taking place through the coming of Jesus Christ, the narrative’s rhetoric calls believers to participate in transformation that comes slowly, one relationship at time. Preaching this Gospel faithfully, especially in our era of anxiety, frustration, and polarization, requires us to pay attention to how salvation emerges over the course of Jesus’ ministry. Read the full article at Working Preacher. Some of the Gospel according to Luke’s most prominent passages describe salvation in terms of utterly transformed sociopolitical values and realities. The energy expressed in those texts’ grand and far-reaching assertions can be difficult to see in the rest of Luke unless interpreters pay attention to the ways Jesus dismantles the tools and ethos of dominance in the more intimate settings of his public ministry. For preachers and teachers who lead others through Luke one passage at a time, interpreting the whole Gospel narrative with those big promises in view is essential. Read the full article, which was published in the October 2018 issue of the online journal Currents in Theology and Mission. Summary: With two short parables about seeds that grow and flourish, Jesus describes the reign (kingdom) of God as something that will indeed blossom. It may take time for that to occur, and the outcome may not look magnificent according to conventional standards of power and greatness. The emergence of that new state of affairs is nevertheless definitely going to occur, possibly not what we were expecting, and certain to provide benefits. I wrote this biblical commentary for those preparing to preach or teach on the passage. Read the commentary at Working Preacher. Summary: Even the briefest parables tell tales of massive upheaval. Jesus’ parables of the hidden leaven and the mustard seeds describe small acts of infiltration that have tremendous consequences. His parables of the treasure in a field and the pearl of great price are about the overturning of value systems and entirely reordered lives. The kingdom of heaven, it appears, involves more than most of us might have expected. It will get into everything. I wrote this article for those preparing to preach or hear sermons on Matthew 13:31-33, 44-52. It was originally a guest contribution to the “Dear Working Preacher” series. Read the full article at Working Preacher. Summary: Jesus’ parable of the weeds and wheat resounds with a number of concerns that the Gospel according to Matthew voices. It expresses worry about the damage that imposters might cause, but there is more worry here about what harm will come to “the children of the kingdom” if one actively tries to weed out those imposters. The challenge is to remain engaged in ministry that serves the wider world and opposes injustice while also leaving judgment up to God. I wrote this article for those preparing to preach or hear sermons on Matthew 13:1-9, 18-23. It was originally a guest contribution to the “Dear Working Preacher” series. Read the full article at Working Preacher. Summary: There are preachers who are apprehensive about broaching social and political issues in their sermons, especially during times in which polarization abounds. How does a commitment to biblical preaching equip those preachers to speak convincingly about the gospel’s implications for the church’s witness and Christians’ public priorities? This article offers three suggestions for preachers who seek ways to make connections. 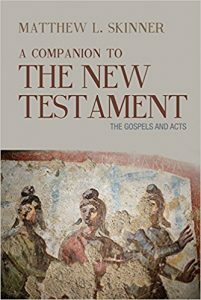 Summary: In the gospels, Jesus tells parables but he rarely explains them for his hearers. Instead, he allows people to enter the unfamiliar and sometimes strange world that the parables describe. These stories and Jesus’ use of them suggest that God promises us a different way of living and being.